The VinylPlus® Product Label may only be used by organisations holding a valid Certificate of Approval issued by VinylPlus. It may only be strictly use for the product/product family that the Product Label is granted for. The use of the VinylPlus Product Label relates only to the certification scheme operated by VinylPlus. The Product Label is the property of VinylPlus, and its use is subject to the conditions of use set out below. The rules for the VinylPlus branding and Vinyl Verified® logo need to be strictly respected. The replication or reproduction of the Product Label can only be made with the authorisation of VinylPlus. The Product Label can be mentioned on product specifications, product sales literature, product brochures, on the product itself and any publicity material that is directly related to the relevant product. Upon request, a limited number of stickers with the Vinyl Verified logo is provided free of charge to the Label holder. Only use of the Vinyl Verified sticker should be to be affixed on samples of products which have been granted the VinylPlus Product Label. These product samples may for example be exposed in showrooms of the Label holder or of the Label holder’s customers, or in a trade show booth. The stickers should never be distributed separately. The company holding the VinylPlus Product Label rests solely responsible for the correct product label use by its design and marketing service partners. The VinylPlus Product Label must not be used to imply approval of products or services not approved or covered in the criteria scheme by VinylPlus. Electronic versions of the VinylPlus Product Label shall only be obtained from VinylPlus. The Product Label is valid from the date of the VinylPlus certification for 2 years. The audit is repeated every 2 years and a new certificate based on the audit results is issued by VinylPlus. If the Product Label Criteria Scheme document is amended after the applicant has accepted an audit, the previous Criteria Scheme should be used. The Product Label certificate based on the previous scheme remains valid for 2 years. If the VinylPlus Product Label is withdrawn or becomes obsolete, the use of the Label shall cease within twelve months of the date of withdrawal or obsolescence. Audit results have a general validity of max. 1 year. Should the applicant not be able to deliver the requested remaining evidence to conclude the audit process within this time frame, audit results will no longer be valid. This document does not confer any right, title or interest in the VinylPlus Product Label, which shall remain the property of VinylPlus. VinylPlus reserves all licensing and enforcement rights, and may update this rules and guidance document from time to time. For the latest version of this document, please consult the Rules and Obligations page of the Product Label website. Unauthorised use and/or misuse of the VinylPlus Product Label is not permitted, especially not for other products in the company’s product range that have not received the Label Certificate. VinylPlus will launch an investigation if we find, or are notified of, a potential misuse, whether through negligence or fraud. If proven, such misuse may lead to a suspension and withdrawal of the Label Certification, a publication of the transgression, a legal action, or a fine. (i) Ensure that the product supplied under a valid current VinylPlus Product Label Certificate of Approval and using the appropriate Vinyl Verified logo, conforms at all times with the requirements of the Label Criteria Scheme and with all other terms and conditions of the Label. (ii) In the event of termination of the Agreement howsoever arising, cease using, remove or obliterate the Label. (iii) Indicate to VinylPlus any fraud or misuse that comes to your notice including the relevant information needed for VinylPlus to take action. Include the Product Label in your marketing and promotional literature only strictly for the product. Contact VinylPlus if you wish to include the Vinyl Verified logo in any press release or press orientated material. Permission to use the logo in this way will not be unreasonably withheld. Ensure that the rules contained in this guidance is adhered to. Ensure that the entire Vinyl Verified logo is clearly visible against the background on which it is being reproduced. Use the black and white version if helpful. Affix the Vinyl Verified stickers on samples of products having been awarded the Product Label. Contact VinylPlus if you are unsure of any aspect of using the label imagery. 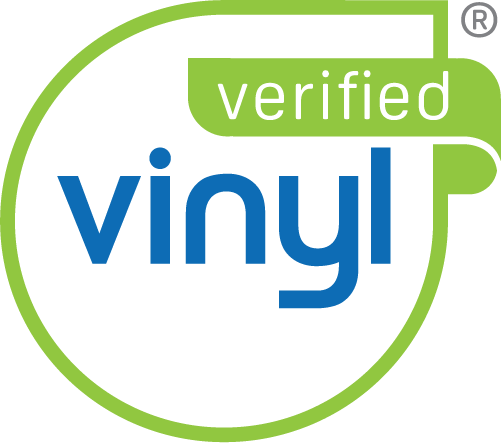 Make the Vinyl Verified® logo too small to identify; it should be legible to the naked eye. Partially cover the image with other brands or copy. Overprint the image with text. Stretch or squash the marks to fit a given size. Use the marks in circumstances that would bring the VinylPlus Product Label certification into disrepute. Use the marks in connection with products or services that are not associated with the VinylPlus® Product Label certification. Attempt in any way to redraw or re-create the artwork for the marks. Pass on copies of the artwork of the marks to any other parties other than your own design companies. Distribute the Vinyl Verified stickers separately.